Properties for sale in Brittany, France - AHIB-1-PI-2699810 Saint Maudez 22980 Large, character cottage, 4 bedrooms, 2 reception rooms. House to renovate. An acre. Fantastic position. 15 minutes to the coast. 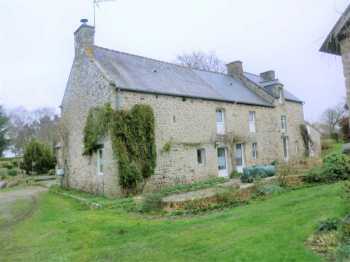 AHIB-1-PI-2699810 Saint Maudez 22980 Large, character cottage, 4 bedrooms, 2 reception rooms. House to renovate. An acre. Fantastic position. 15 minutes to the coast. For me, this fantastic house offers pretty much the perfect package. It has the lot! Great appeal from the outside, packed with character inside, but with modern touches & loads of space. A project if you want it, end of a hamlet setting, with it's own land all around. 5 minutes from a host of wonderful villages, 10 minutes to the Medieval joy, that is Dinan, & only 15 minutes to a selection of beaches. If you are "ticking boxes" you must have a lot of ticks by now?! Inside the house is light, & bright, thanks to windows, & glazed doors, front, & back. The first room, the kitchen, is modern in style, fully fitted with a induction hob. there is a double height ceiling, & exposed beams. Into the first of 2 lounges, both featuring granite, inglenook fireplaces. A feature of this area, they add presence to any room, & of course, huge warmth! Large glazed doors along 1 side, bring light into both these rooms. Next is the ground floor bedroom, featuring yet another inglenook, & a door out onto the side patio, a view of the fish pond. A modern shower room, & handy back kitchen, complete the ground floor rooms. Up the wooden stairs, off, of the airy landing, are 3 more double bedrooms, a bathroom, & another room, that would make a large office. The house benifits from double glazing throughout. There is a new, geothermic underfloor heating system, & free water from the well. Outside, at the edge of the plot, is another house for renovating. The walls, & roof are solid. It faces away from the main house, over open countryside. It would make a superb rental. The land is all around the house; flat, with flower beds, a vegetable area, fruit trees, & large lawns. There is a large hanger, and a couple of stone barns. The house is the last one in a little hamlet, just on the edge of the small village. It faces away from the hamlet, so feels very private. Saint Maudez is in a wonderful area, a 5 minute drive will take you to a host of lovely villages, such as Corseul,Plancoet, Plelan le Petit, you will always find something going on, whatever time of the year¨. If you want somewhere larger, the superb, medieval town of Dinan is just 10 miutes away¨. So there you have it, a wonderful house, in a superb location, all boxes ticked I think.